Arrests bring total number of those detained over this week's clashes between IDF, local extremists, to seven. Security forces arrested five additional suspects this morning, in relation to clashes with IDF forces this week around the town of Yitzhar in Samaria (Shomron). The men are all believed to be from Yitzhar, and were detained in relation to an incident in which a group of extremists destroyed an IDF outpost in retaliation for the demolition of four family homes in the community. Two of those arrested are between 16-18 years old; the other three are 23, 28 and 29, according to Channel 10. It brings the total of arrests in the past two days to seven. Yesterday two other suspects were arrested: a 40-year-old Yitzhar resident and a resident of the nearly village of Havat Gilad in his twenties. Yitzhar has recently been at the center of a dramatic confrontation between the IDF and an extremist element in the town this week, which began after security forces demolished the home of a local family, triggering anger among many residents. On Sunday, IDF Colonel Yoav Yarom found his tires slashed outside the community. Yarom stressed to Arutz Sheva earlier Tuesday that the Yitzhar residents themselves apologized immediately over the vandalism and helped to repair the damage. A minor was arrested in Jerusalem on suspicion of participating in the attack. On Monday, the minor was released to house arrest; however, a possible copycat attack 24 hours later drove tensions over the edge. 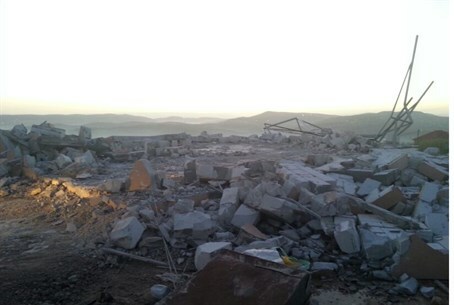 Tuesday morning, the IDF and other security forces began demolishing homes in Yitzhar - in what local community leaders have condemned as an act of collective punishment - and in response extremist youths vandalized a nearby IDF outpost. Politicians from all sides of the political spectrum have condemned the attacks, and many have stressed that those responsible are not representative of the majority of Yitzhar residents. Meanwhile activists from the Homesh First group, which conducts regular trips to the ruins of the town of Homesh, slammed the IDF's decision to cancel the annual Passover event in the former Samaria community. Activists say the decision to cancel the trip was a response to tensions at Yitzhar, and further accused authorities of using the opportunity to quash the Homesh movement at the same time. The IDF had denied the claims, saying the decision to cancel was unrelated. But Shomron Regional Council head Gershon Mesika said he didn't buy it and accused the IDF of "collective punishment". "Just as it was decided to punish all the residents of Yitzhar because of twopunks, and four houses that were in the process of being regulated were destroyed, now the IDF is deciding on collective punishment,” he said. “I would like to say in the clearest possible way: There are a handful of guys who behave in a manner which we condemn, but the other 98% of the residents in Judea and Samaria are law abiding people, the salt of the earth, with the highest percentage of reservists in Israel,” continued Mesika. “The entire settlement enterprise should not be punished because of a few rioters, most of whom are not residents of Judea and Samaria,” he added. Homesh was destroyed in 2005 as part of the "Disengagement Plan" which saw thousands of Jews expelled from Gaza and parts of northern Samaria.